“Focal Point will provide a central gathering place for residents of North Lawndale, Little Village, and Back of the Yards to have the kinds of services and opportunities so important to creating economically vibrant communities,” said Mayor Rahm Emanuel. The Focal Point Community Campus will bring resources to more than 400,000 residents of the Lawndale, Little Village, Pilsen, Brighton Park, Back of the Yards, and Archer Heights neighborhoods. Focal Point Community Campus is a 1 million square foot complex that will be replete with a collection of retail, wellness, education, arts, and recreational services. Major retail tenants, providing community members access to food, clothing, and household items. A newly constructed Saint Anthony Hospital, which will continue to provide emergency and medical care that regardless of ability to pay. An education center offering a variety of educational opportunities including a charter school and trade school, to name a few of the multiple features. “The National Latino Education Institute is an excited partner for this transformative development. When the Washburn Trade School went away, it took with it an engine that provided job education for our community,” said Elba Aranda-Suh, executive director of National Latino Education Institute. 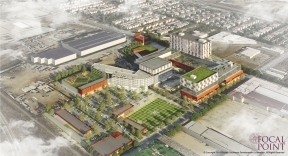 “Now, our new trade school and the variety of programs and services that will be offered at Focal Point will equip our community with the tools for education advancement and revitalize the surrounding neighborhoods with job training and employment growth.” Chicago Southwest Development Corporations is leading the construction. For more information, visit www.focalpointchicago.org.